I'm busy in my little sewing nook for the rest of this week....and maybe even beyond! And when I'm working on a project, I tend to forget that everyone and everything exists! So, forgive me, if I ask you to slide your favorite snacks under my door, or check on me once in a while to see if I've come up for air! Like a lot of you, my little space often gets overwhelmed and very messy. But I usually clean it up after all of my bigger projects to jumpstart my next one! Its a happy, and peaceful place and I love being in my little sewing room. 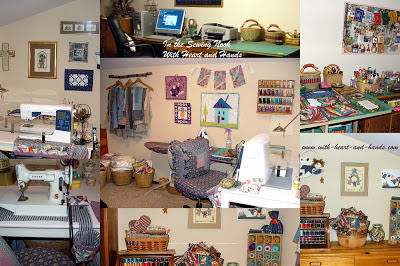 So, mine is called a nook when I'm blogging and a a just plain sewing room, when I"m not. So, what are your favorite snacks once you are working on yours? Do you drink hot tea all day long (herbal) as I do? Do, you sneak in cookies or crackers or pretzels (I'm on a pretzel kick right now), do you eat all of your meals in there because you sew on your dining room table? What do you call yours? And is it a sewing studio? an old fashioned sewing room, a shared space with the rest of the family like a sewing corner? A nook? A cranny? A little bit of here, there, and everywhere? And because I have always loved lists, and love to organize and categorize, and most of all...I love to share what I have, what I know, and what I save with others...here is my ongoing master list of links to "Sewing Rooms and Studios" every where of all different kinds! Some of these are fabulous, some are super artsy and creative. Some have the best stash and storage ideas, ever...but all of them are just plain fun! And boy, once I made this collage...my tiny little spaces seemed so busy. Well, they are! Always busy, always being creative and always lots and lots of fun! Comment and tell me about yours! What do you call your space? Then if you want to share....create a simple blog post with a photo of your space, add my link to your blog post and send your link to me...I'll add you into the list, below! And thanks to those of you in different blogs, and community sewing groups of all kinds... for sending me links and other tidbits! Please do send me some links to 'real' sewing rooms and not just showcases like some of these! Anna Marie Horner: Scenes from a Studio. Quilt Studio Set Up and on HGTV's Simply Quilts. Click on *Print Version* at top of page to get the best "view." As impactful as my chemical sensitivities can be, I'm finding anemia to be a real bugaboo. I spend most of my days in my studio (that's what my family has learned to call my sewing room), even eating in there, but not as much sewing is getting done these days. It's the best lit room in the house so that's where I want to be most of the time.